Launched in 1992, the Convergence India series of expo is credited as India’s leading Communications, Broadcast, IT & Technology Show. 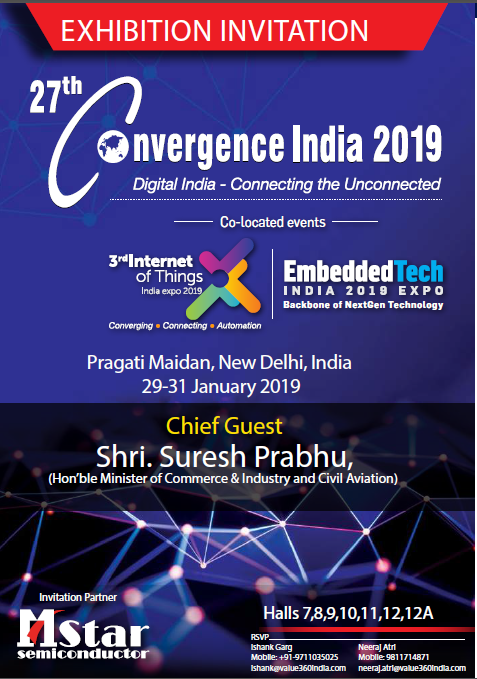 This year the expo will be held in New Delhi from January 29 to 31, 2019 at Pragati Maidan. The three-day exhibition and conference, will welcome 600+ exhibitors, 20,000+ visitors and 200+ speakers from over 30 countries. The expo will see products and services from across areas such as telecom & mobile communication, broadcast & digital media, information technology & security, cloud & big data, virtual & augmented reality, artificial intelligence, robotics, drones, application development, M2M solutions, semiconductor manufacturing, smart cities, etc. as well as emerging technologies and enterprise solutions under one roof.